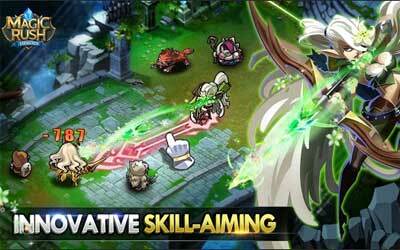 Previous version Magic Rush: Heroes 1.1.149 apk for Android will help you to downgrade or install older app easily. This is one of the best Role Playing apps. Socialite: When using Heavy Fog, it will deal damage to and blind up to 3 back row enemies and lower their attack power. Frankenstein: Grunk changes into a boulder after Molten Fissure is triggered, dealing dmg & a small knock back effect to enemies hit. Rock minions from Molten Fissure also turn into a boulder upon death, but do not deal a knock back effect.